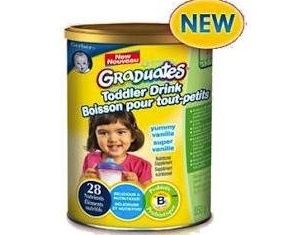 Request your free sample of Gerber Graduates Toddler drink. Simply fill out the request form and it will take about 4-6 weeks to arrive. The Gerber Graduates Toddler drink is available for a limited time only, so order your free samples today. Click here to order. A wholesome boost for growing bodies. Help ensure your active toddler gets more of the nutrition they need. NEW Gerber® Graduates®Toddler Drink helps fill the nutritional gaps in your little one’s diet to help them grow up healthy and strong! It’s the first and only toddler drink with B. lactis, a probiotic that contributes to your child’s healthy digestive tract flora. It’s daily nutrition that’s different from any other – Profoundly different. Appropriate for children from 1-3 years. Make this a delicious part of your toddler’s day by blending fresh or puréed fruit such as strawberries or bananas with 200 ml of prepared Gerber® Graduates® Toddler Drink. Blend until smooth.